Fisheye lens: Our classic Fisheye lens takes in 180 degree. Your image will be less distorted, but still have that distinctly fishy look. Macro lens: The intensity of detail will have you passing your phone around to show everyone how gross eyeballs are. For the reason of protecting the lens, the Wide Angle Lens and Marco Lens will be connected together when you receive it. Compatible with android 4.2.2 OS or newer and ISO6.0 or newer. Note:if your phone can not use this well, please download a software “Camera 360”,set the function of volume keys to taking Photographs. 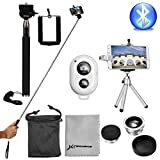 This entry was posted in Discount Photography and tagged 3in1, Bluetooth, Camera, DC540, lens, Remote, Selfie, Silver, Stick, Tripod, XCSOURCE® by Ball Photo. Bookmark the permalink.